output: zip (cbz) with no compression. Depending on resampling used output files are at least 2.5 times smaller than source with subjectionably neglectable quality loss. When combining conversion to WebP with 50% resampling from 1920px output files are typically 10 times smaller than source. Application is native and portable, settings are stored in local ini file, there are no dependencies on any runtime framework or non-standard dlls (except for those distributed along with it, i.e. 7z.dll). Note: source files are immediately extracted to temporary subdirectories which allows browsing/editing content before converting. Make sure you have enough disk space to extract all queued files. Version 0.2. Added picture width info column (currently for jpg files only, but that's vast majority of source files) - helpful when selecting picture scaling for output. settings: priority for worker processes. settings: play sound when done. added default scaling for specified picture size(s) setting; new scaling list entries can be added with down arrow. settings, as requested: additional parameters can be passed to cwebp.exe, see cwebp page or run "cwebp -longhelp" for list of available options. FIXED: with source containing png images resizing was set by default to 0% resulting in no conversion. increased maximum allowed source file size to 2GB (this was intended to be safeguard for accidental dropping in of non-comic "big" archive, but apparently there are 700+ MB scans out there already). 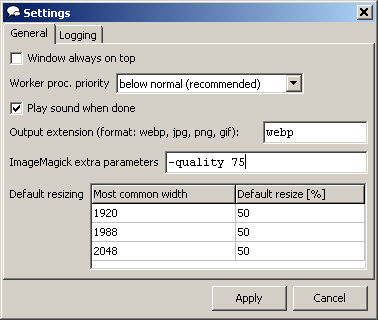 resize: added list with common resize percentages (50%, 33%) to choose without typing. three submodes for conditional resize: resizing is higher or wider, only if wider or only if higher. Note that quality parameter for jpg and webp cannot be compared directly and may need some experimenting if switching from webp to jpg. Currently application has 260 characters paths limitations. It's recommended to run application from location near to drive root if converted files have long names (application is creating temporary subdirectories with same names as file names and extracts file contents to them). For WebP and CBR/CBZ in general I'd like to recommend SumatraPdf - great open source reader with WebP support (official since version 2.4): http://blog.kowalczyk.info/software/sumatrapdf/free-pdf-reader.html. CbxConverter 0.8.1 (using cwebp.exe) seems to work with Wine / Ubuntu 16. 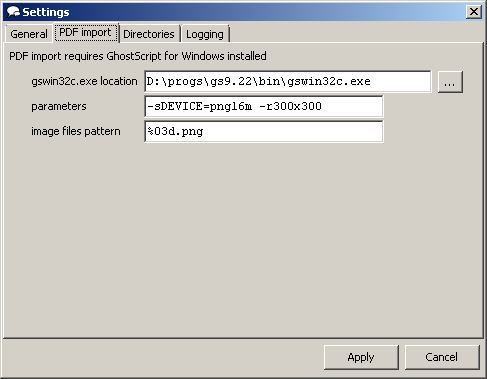 CbxConverter 0.9 and newer is using magick.exe and apparently there are some runtime dlls missing. I haven't tried copying them from windows - to get list of missing dlls run "wine magick.exe" from linux terminal.